Modern amenities and vintage architecture bridge the gap between Pennsylvania’s past and present at Radisson Lackawanna Station Hotel Scranton. Situated within walking distance of The University of Scranton and the Steamtown National Historic Site, our hotel was originally a French Renaissance-style train station that opened in 1908. Guests appreciate our proximity to The Marketplace at Steamtown, located in the heart of the Historic District, and McDade Park, only five miles away. Drive about 15 minutes south to access the ski slopes, stores and water rides at Montage Mountain or see a show at the Mohegan Sun Arena. You can also take advantage of our free shuttle service to Wilkes-Barre/Scranton International Airport (AVP). Let the Radisson treat you while you’re working hard on the road. Book one of our Business Class Rooms to enjoy a complimentary breakfast each morning and a complimentary drink voucher each evening. Indulge in a delicious breakfast, lunch or dinner at Carmen’s 2.0 Restaurant & World Tour Menu, one of our on-site restaurants. 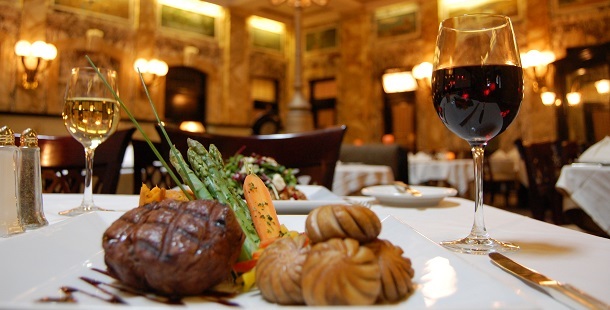 In addition to tasty culinary creations, Carmen’s features an award-winning wine and beverage selection. If you need a caffeine boost or something to satisfy your sweet tooth, stop by our Station Café, located in the hotel lobby. Sip premium coffee and dine on decadent desserts while you stare in awe at the historical architecture. A family-friendly eatery by day and a hip social hot spot by night, Trax Bar + Kitchen offers a fashionable place to share appetizers, entrees, desserts and drinks. Want a quiet breakfast after a late night? Room service is also available. The University of Scranton – Established in 1888, this private Catholic and Jesuit university provides students with a high-quality education. Located just half a mile from our hotel, The University of Scranton also boasts a beautiful campus worth touring. Electric City Trolley Museum – Situated only one mile west of the Radisson, this mill-building-turned-museum shows visitors why Scranton became known as the Electric City. Interact with exciting exhibits, see the underside of a trolley car, and buy a ticket to board an operational trolley. Lackawanna Coal Mine Tour – Immerse yourself in a coal-mining experience as you descend 300 feet into an anthracite mine. This interactive excursion is located approximately four miles from our hotel. With an array of ballrooms, boardrooms and hospitality suites, the Radisson can easily accommodate up to 1,000 guests for your upcoming corporate meeting or gala. When your guests aren’t admiring the architecture, they can connect to free Wi-Fi to follow along with your presentation. Our friendly staff can also provide audiovisual options and custom catering. Create lifelong memories with a catered wedding reception in the elegance of the Grand Scranton Ballroom, or host an unforgettable banquet with the assistance of our dedicated event staff.